Practice made perfect for BlaineCounty youngsters who earned a pile of podium results and improved their finishing times Saturday, July 9 during the State Hershey track and field meet on the Madison High oval in Rexburg. Thirteen different BlaineCounty kids ages 9-12 climbed the podium for finishing first, second or third in their events. The one-day competition featured some of the best GemState athletes coming from programs stretching across the entire southern part of Idaho. Blaine County boasted five gold medals—girls’ relays from Ketchum (ages 11-12) and from Carey (9-10), Hemingway Elementary School 10-year-old Jenna Nurge in the 100-meter dash, Hemingway’s Madison Ferris in 9-10 standing long jump, and Hailey’s Jedson Waters in boys’ 9-10 softball throw. Waters uncorked a 265-foot throw to win by nearly 33 feet. Nurge (15.61 seconds) blew away the girls’ 100m dash field, winning by .51 seconds. Ferris captured the girls’ 9-10 standing long jump by two inches. Equally impressive was the effort of Hemingway’s 9-10 girls’ 4x100m relay that moved up an age bracket and still won the 11-12 girls’ relay in 1:03.90—by .70 seconds over a Caldwell squad. 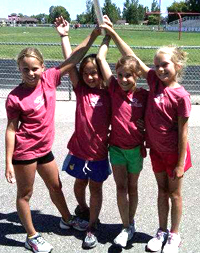 They were Payton Bacca, Jenna Nurge, Clara Jenner and Madison Ferris. All are 10 years old, but Jenner turns 11 in December so they had to run with older girls. Also taking state gold in 1:11.26 was Carey’s 9-10 girls’ relay squad of Kodi Green, Lindsey Morey, Bailie Morey and Athanasia Versis. Second-place silver medals went to Carey’s Versis (softball throw), Sariah Nilsen of Carey (standing long jump) and Nathan Stouffer of Bellevue (boys’ 11-12 standing long jump). Earning third-place bronze Saturday at Rexburg were Payton Bacca (50m dash), Lindsey Morey (200m dash 9-10), David Rau of Ketchum (200m dash 9-10) and Logan Verst of Hailey (standing long jump 9-10). Girls' standing long jump: 1—Madison Ferris (Ketchum) 6-6 (10 inches farther than last year’s 8th place state finish and nearly 6 inches better than her district qualifying jump). 2—Sariah Nilsen (Hailey) 6-4 (nearly 3 feet farther than district) (17 jumpers). Girls' softball throw: 1—Sade Williams (Idaho Falls) 83-7. 2—Athanasia Versis (Carey) 76-7. 4—Shantell Chavez (Carey) 72-4 (12 throwers). Girls' 50m: 1—Sadie Eddington (Pocatello) 7.98 seconds. 3—Payton Bacca (Ketchum) 8.33 (.47 seconds faster than last year’s 7th place state finish) (16 runners). Girls' 100m: 1—Jenna Nurge (Ketchum) 15.61 seconds (.39 seconds faster than district qualifying time). 5—Madison Ferris (Ketchum) 16.31 (.97 seconds faster than last year’s 10th place state finish). 6—Payton Bacca (Ketchum) 16.36 (21 runners). Girls' 200m: 1—Payton McBride (Boise) 33.56 seconds. 3—Lindsey Morey (Carey) 35.56 (1.27 seconds faster than district). 4—Madison Ferris (Ketchum) 35.59 (1.11 seconds faster than district). 5—Jenna Nurge (Ketchum) 36.29 (16 runners). Girls' 400m: 1—Whitney Bower (Nampa) 1:11.63 seconds. 6—Athanasia Versis (Carey) 1:24.03 (3.67 seconds faster than district) (13 runners). Girls' 400m relay: 1—Carey (Kodi Green, Lindsey Morey, Bailie Morey, Athanasia Versis) 1:11.26 seconds. Boys' standing long jump: 1—Ellis Magnuson (Boise) 6-5.5. 3—Logan Verst (Hailey) 6-4 (2 inches farther than district). 11—Anthony Corrales (Hailey) 5-8 (15 jumpers). Boys' softball throw: 1—Jedson Waters (Hailey) 265-8 (nearly 172 feet farther than district). 9—David Rau (Ketchum) 92-4 (18 throwers). Boys' 50m: 1—Watson Crenshaw (Idaho Falls) 7.81 seconds. 12—Jedson Waters (Hailey) 8.57 (.24 seconds faster than district) (19 runners). Boys' 100m: 1—Magnus Hemingway (Meridian) 14.90 seconds. 9—David Rau (Ketchum) 16.45 (24 runners). Boys' 200m: 1—Magnus Hemingway (Meridian) 32.53 seconds. 3—David Rau (Ketchum) 33.96. 8—Garrett Stouffer (Bellevue) 36.63 (17 runners). Boys' 400m: 1—William Rodriguez (Nampa) 1:16.61 seconds. 5—Carson Simpson (Carey) 1:20.12 (.58 seconds faster than district). 6—Garrett Stouffer (Bellevue) 1.20:70 (1.81 seconds faster than district) (14 runners). Girls' standing long jump: 1—Morgan Bower (Nampa) 6-11. 4—Stella Barsotti (Hailey) 6-8 (nearly 8 inches farther than district) (15 jumpers). Girls' softball throw: 1—Karli Hall (Chubbuck) 98-8. 5—Audra Mary (Hailey) 83-11 (12 throwers). Girls' 100m: 1—Maddie Glascock (Twin Falls) 15.60 seconds. 10—Stella Barsotti (Hailey) 16.84 (16 runners). Girls' 200m: 1—Ally Whitmer (Pocatello) 31.78 seconds. 8—Stella Barsotti (Hailey) 34.45 (.50 seconds faster than district). 9—Kinley Miller (Ketchum) 34.51 (1.27 seconds faster than district) (17 runners). Girls' 400m: 1—Morgan Bower (Nampa) 1:12.46 seconds. 6—Kinley Miller (Ketchum) 1:19.74 (15 runners). Girls' 400m relay: 1—Ketchum (Payton Bacca, Jenna Nurge, Clara Jenner, Madison Ferris) 1:03.90 seconds (1.79 seconds faster than its district qualifying time) (6 teams). Boys' standing long jump: 1—M. Hunter Madsen (Rexburg) 7-8.25. 2—Nathan Stouffer (Bellevue) 7-8 (8.25 inches farther than last year’s state championship finish, nearly 1.5 feet farther than district) (12 jumpers). Boys' 400m: 1—Tyler Matthews (Chubbuck) 1:03.09 seconds. 4—Nathan Stouffer (Bellevue) 1:13.15 (4.24 seconds faster than last year’s 6th place state finish, 3.83 seconds faster than district). 9—Bayley Bingham (C) 1:15.73 (5.18 seconds than last year’s 9th place state finish, 1.83 seconds faster than district) (17 runners). Boys' 800m: 1—Oliver Munch (Boise) 2:34.25 seconds. 4—Nathan Stouffer (Bellevue) 2:45.44 (2.35 seconds faster than last year’s 3rd-place state finish, 9.24 seconds faster than district) (15 runners).